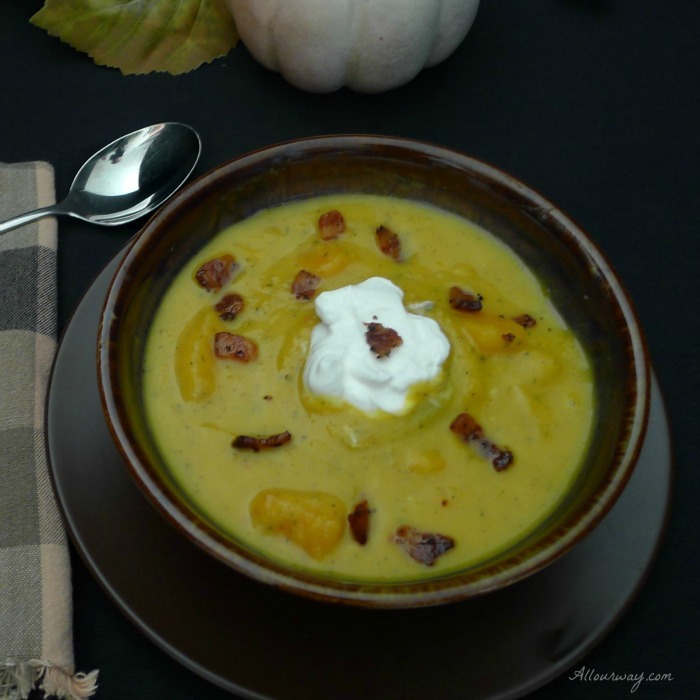 If you like creamy soups with just a touch of spice, Butternut Squash Bisque with Bacon is it! Normally a bisque is very creamy but we wanted to add just a bit of texture by leaving some small chunks of roasted butternut squash. When the bisque is ready to serve we like to drop a dollop of sour cream on top and then a sprinkle some bacon bits to add a nice salty crunch. I’ve been meaning to sit down and finish the butternut squash bisque post for almost a week. What have I been doing? Well, I’ve been trying to figure out the ins and outs of Lightroom and Photoshop and get away from my crutch — PicMonkey. If you’re not familiar with photography, Lightroom and Photoshop are photo editing programs that can create miracles, or so I’ve been told. To be honest, I’ve witnessed the power of both programs but for some reason that power eludes me. I promised myself that November would be the month that I learned the two programs and start using them for my food photography edits. Unfortunately I’m also trying to figure out how to use the Manual mode on the camera and shoot in RAW. When I told my Honey that I had to shoot in RAW for the two programs, he got a gleam in his eyes. I had to explain that the camera does the RAW thing and it all has to do with the quality of the editing. I know– too much information– I can feel your eyes glazing over. Well, to accomplish my goal I went back to listening and watching my videos on LR and PS. As I watched, I nodded my head in perfect understanding. Everything seemed amazingly clear. I got all excited about using the information. I knew this info would turn my photos into extra-ordinary yummy representations of our dishes. I couldn’t wait for the instructor to finish the instruction so I can get to it! The minute the video screen went black I opened up Lightroom. I pulled up a photo of the Butternut squash bisque. Okay, so far, it went according to the instructions. The photo was now in what is known as the Library module — believe me it’s a whole different language. I knew I was supposed to go from there to the Develop module — that’s where all the magic happened. I looked at the new screen and froze. I didn’t remember a thing. Did the instructor say to take care of the white balance first or was it the exposure? No, no it was the blacks, or was it the whites? I started messing first with one slider and then another. You see, the adjustments are sliders. Argh!! Oh my heavens, the photo ended up looking so bad I had to reset. How frustrating! I did this several times and each time I had to hit reset. *sigh* I was back to square one. But I’m a stubborn Italian. I will conquer Lightroom and Photoshop, just not this time! 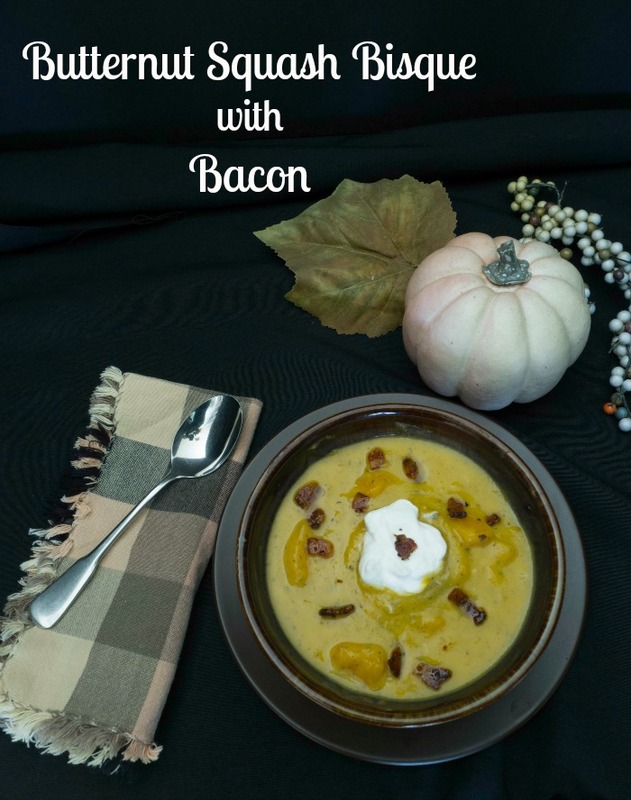 And since I wanted this post out before Thanksgiving because the Butternut Squash Bisque with Bacon would make a delicious first course, I knew I needed to go back to my old reliable photo editor — PicMonkey. 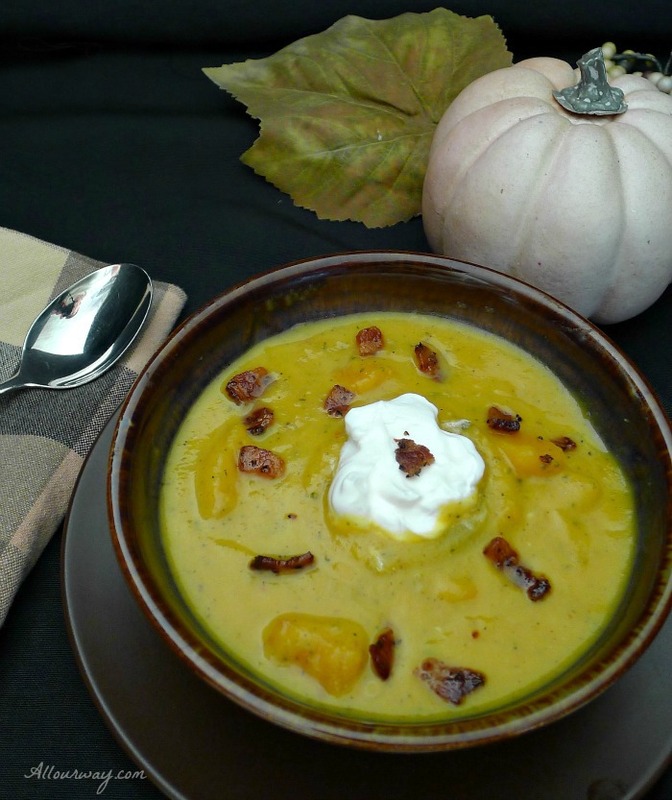 A delicious creamy squash soup with a touch of spice. It is finished with a dollop of sour cream and a sprinkle of salty bacon bits. Preheat oven to 400 F. Place squash, onion, carrot and garlic in a roasting pan with herbs. Toss with olive oil and sprinkle with sea salt. Roast 40 minutes until the squash is soft. Place vegetables in a soup pot or Dutch oven. Add broth, wine, allspice and red pepper flakes. Simmer for 20-25 minutes. Remove from heat. If you'd like some texture to your soup, remove some squash chunks, about 1 cup, with a slotted spoon and set aside. Puree the soup using a stick blender or in a regular blender. Pour back into the pot or Dutch oven and stir in the half and half. Add the squash chunks to the soup. Adjust seasonings to taste. To serve: ladle soup in bowls and add dollops of sour cream in center then sprinkle bacon bits top. Oh soup season in just getting in now.. I made our first winter soup yesterday. Was so good to start eating soup again. So comforting..Nothing beats a creamy delicious soup like this one. Well comfort food/soup season is just around the corner. This looks and sound delicious. Perfect for a cool fall day, and it would make some might fine leftovers too!! I love cooking in my dutch oven. 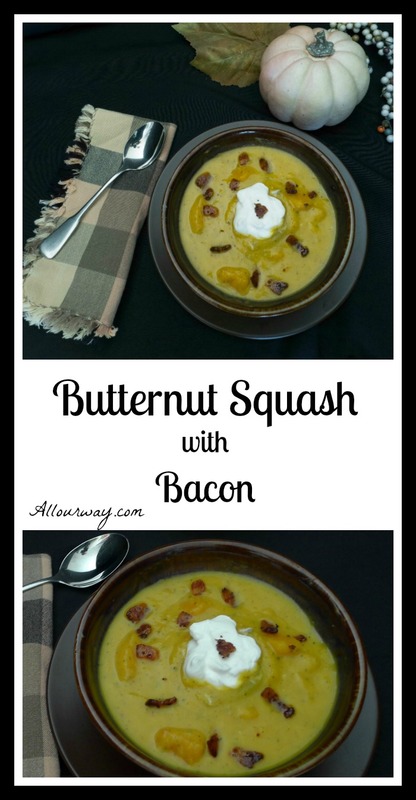 Yum, I love butternut squash soups, bacon is a great addition, this sounds delicious! It is good and you’re right – the bacon adds that saltiness and crunch! This recipe sounds so savory and flavorful! Leaning photo editing is so challenging and it takes so much practice and trial and error! You’ll get there! Keep up the good work! Thank you! And I agree that it does take work — I get so excited for the people who get their photos featured on the sites such as Foodgawker and Tastespotting. Hopefully one day . . . This soup looks lovely! Love all the flavors you have here!! Gorgeous pictures too! This sounds so yummy. I have to say I am biased, though – I think everything tastes better with bacon!!!! 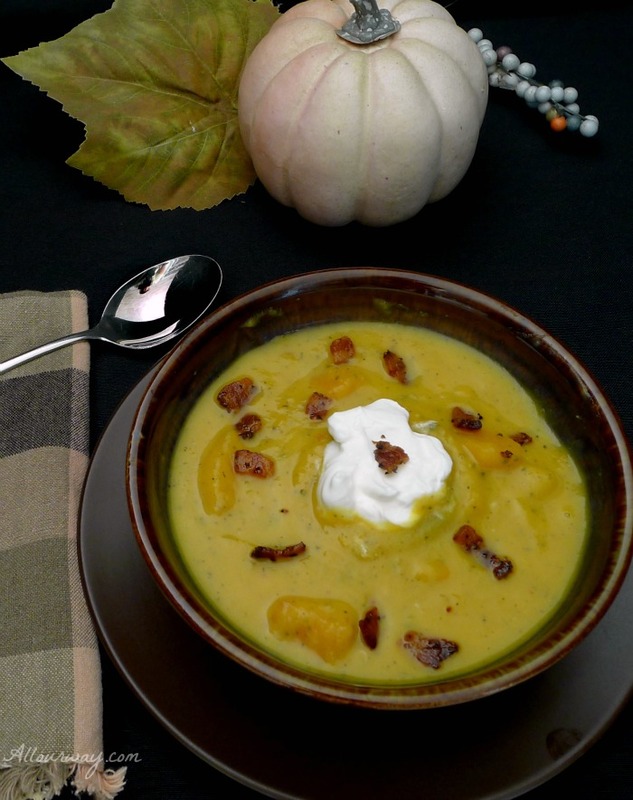 I agree– butternut squash was made for soup! And I figure that I will eventually learn the programs as well as all of the capabilities of my camera then I’ll be ready for a fancy dSLR. Have a great weekend and I’m glad I’m not the only one who can’t pick up LR and PS right away. You’re right!! I think I’ll console my self now with a double bowl of soup!! Thank you for commenting. Oh, I feel your pain. There is always so much to learn and it can be so incredible frustrating. Everyone keeps telling me I need to get Lightroom, but I’ve only just got a proper digital camera and it’s hard enough trying to learn that! I adore squash soup of any kind BTW and your photos look pretty enticing to me. I wish I did have a proper dSLR. Mine can do just about everything a dSLR will do but I can’t switch lens 🙁 I figure I can learn all of the ins and outs and then progress, hopefully.And thank you for your kind comment. I would do anything for a bowl of this right now. Thank you Chiara!! Buona giornata e ti mando un abbraccio. I think this is the way to make this bisque. I would definitely need the salty of the bacon to cut the sweet. Love the addition of all the herbs. Sounds wonderful. This is one of my favorite soups! And your pictures are awesome, but believe me – once you conquer the others – you will have some fun! It’s a never ending process….I’m still learning and loving it! Thank you Annie!! I know I’ll get better — and I do love learning. Your photos are simply fantastic. I think you photos look great, Marisa. I just use the photo capabilities of my website host, Word Press. Works for me. Most importantly, your bisque looks divine. I love butternut squash in soup and your recipe looks very special, perfect for a Thanksgiving first course. Thank you Jovina. As I mentioned I have a preconceived idea of what I want my photos to look like and I’m not getting it but I’ll keep trying. And I do have to admit the bisque was delicious! I wish it would have made a humongous batch — I’d still be slurping on it. Learning new technology can be SO hard! I know that I can get pretty distracted over things like that. Thankfully it is just case of getting better over time. As for the soup, this sounds delicious and of course I love the bacon in it! Thank you Sarah! Technology and I just don’t get along. You know the saying about teaching old dogs new tricks. The soup is good and so very simple. I imagine it would make an elegant first course. Thank you for commenting. I knew if I came and checked this out it would be delish! I bet the bacon is the PERFECT addition! I need to learn Lightroom and Photoshop too – there is so much to do that it is hard to make time to learn something new – especially when you feel pretty confident about using what you have been using. I’m right there with you.